One year ago, I learned the story of 11-year-old Colin, an unlikely hero who is asking us to make the world a kinder place with good deeds and bow ties. The story goes like this: Last February, Colin’s mother Jennifer asked if he wanted a party for his 11th birthday. He replied there wasn’t a point because he had no friends. Jennifer decided to create a Facebook page called Happy Birthday Colin. Her goal was to reach family and friends to extend birthday greetings and make Colin feel embraced. The mother wanted her son to know he isn’t alone. In an hour, the page had 13 followers. The next morning, it had 50. People began sharing the page and the story, and it garnered international attention. Within days, the page jumped to more than 1 million followers. These days, the page has been renamed Colin’s Friends and has more than 2.1 million members worldwide. One year later, Colin’s story is making a difference. Colin and Jennifer are asking people across the globe to recognize Be Kind Day, which coincides with Colin’s 12th birthday today. This image was shared on the Colin’s Friends Facebook page, featuring Colin wearing his bow tie. Colin has always been the first one to help someone, even when things were tough for him, he was always kind to everyone. So for his birthday, we would like to ask you all to do Colin’s favorite thing – anonymous acts of kindness. On March 9th, we’d like to declare it Be Kind Day, and we are asking all of Colin’s Friends to do an anonymous act of kindness, but to honor Colin’s birthday, please add a bow tie into whatever you do. For example, leave a card for someone who needs cheering up, and sign it only with a bow tie. Or make a care package for a homeless person, and slip a note card inside with a drawing of a bow tie. 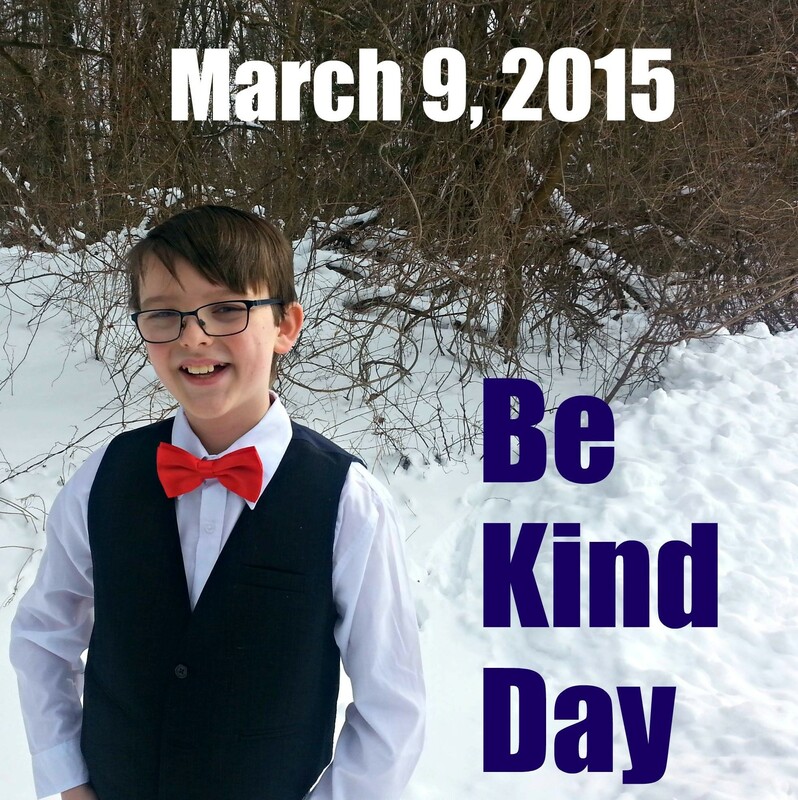 On March 9th, to celebrate Colin’s 12th birthday, let’s make kindness go viral! This young man went from friendless to famous in a matter of days. Now he and his family are using their Facebook platform to reach an international audience of millions to encourage kindness and generosity. Colin is changing the world, one bow tie-labeled act of kindness at a time. And he’s asking us to join him. Let’s help him make the world a nicer place today. This entry was posted in Children and Family and tagged Be Kind Day, children, Colin's Friends, family. Bookmark the permalink. March 9, 2015 at 9:57 p.03. I never knew about this! So cool! You’re making me regret I have no bow-tie stamps or bow-ties to pin on a hat.